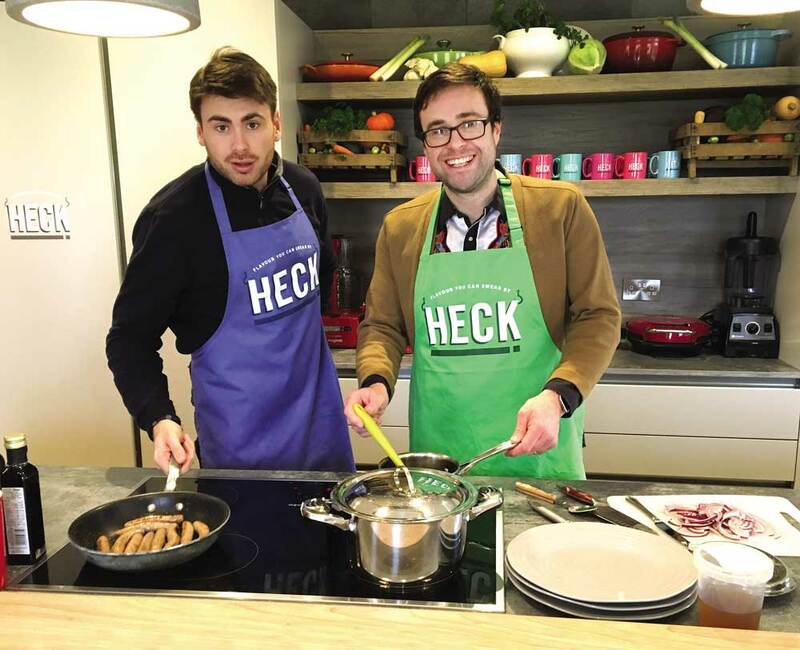 Northern Life's roving reporter Jim Coulson visits Heck to try his hand at sausage making. I feel like I’m in the boardroom on The Apprentice and the task has not gone well. I have tested the patience of Isabel and Calum from the product development team at Heck, the North Yorkshire-based market-leading sausage maker, and I realise that now. These are patient people; they have just been telling me how it has taken at least a year-and-a-half to develop the perfect vegan sausage, which has a low impact on the environment, holds together on a barbeque and, most importantly, tastes great. They are willing to put in the hours, even when it looks like the cause is lost. However, that cause really was lost when they let me loose creating my own sausage. How wrong can you go with a slab of pork, a carton of dried pea mix and a tub of sage? Very wrong, it turns out. “I think perhaps you added in a little too much of the sage,” says Isabel, making one of the understatements of the year so far. caramelised onions, and those used to serve up the pork and apple sausage toad-in-the-hole with apple infused black pudding have been cleared. The dishes bearing my rudimentary sage abominations are pretty much untouched. It’s another potential career choice to scribble off the list. I may have created the single worst edible item ever to have graced the Heck site, but I still feel welcomed in by this friendly company. It is a family affair, both literally and figuratively. Set up by Debbie and Andrew Keeble in 2013, the idea was always to involve their children from the start, and they all play an important role in the day-to-day running of the business today. But you don’t have to be a Keeble to be part of the family. Everyone in the factory knocks off for lunch at 11:30 and they sit together in the bright and cheery canteen, talking to each other for an hour. Actually talking. Not mindlessly scrolling through their Facebook feed for 60 minutes. Whether you are in management, or on the production line, you all eat together. In addition, everyone (including the vast array of family pets) has a portrait on the wall in the long corridors around the offices, each adorned with the employee’s name and favourite Heck product. Not only does everyone chat, but they also listen. Jamie tells me proudly about one their employees, Saulis (favourite sausage: Heck 97), who suggested a new way of distributing the products between two different packing lines. He then takes me onto the factory floor to show me the invention that arose from that conversation in action. It is one of the essential components that helps the firm produce two million sausages per day. Once they are packed and boxed, they are loaded onto lorries, which head out across the UK. They spend the night in a depot before hitting the supermarket shelves the next day. From talking to Jamie, it is obvious that this is a company that doesn’t rest on its laurels. They are always looking for the next phenomenon and to ensure they are at the forefront. They may be the number one premium sausage brand in the UK, with a whopping 50% of the market, but the food industry is a fast-moving business. His mum Debbie first mooted the idea of a chicken sausage a couple of years ago, an idea that was met with derision by some, including her husband Andrew. However, they went ahead with it and Jamie credits that decision for much of the brand’s subsequent success. He reckons it landed just in time to benefit from a trend amongst consumers for cutting down on red meat. It was the first premium product of its sort and it was an instant hit. Their competitors have all since launched their own chicken sausage ranges, but Heck are already moving forward. The vegan sausage is just part of this innovation drive. They hope to add soups and ready meals to the line in the next year, with a special festive range for next Christmas. They are also planning an assault on Europe, even though many UK businesses are holding off with expansion onto the continent until the fallout from Brexit becomes more clear. “We’re looking to sell British pork and chicken to the Germans in German supermarkets” Jamie says with a grin on his face, “they are the kings of sausages. It’s a bit risky, but heck, let’s give it a go.” If you were wondering, the pun was very much intended. The name Heck came from that very attitude – “heck, let’s give it a go” – and that appears to be how this business thrives. “In the first year of business we appeared on The Fixer on BBC2 with Alex Pollizi,” says Jamie. He recalls that the edit of the business advice programme, “made us all look like idiots”. However, he insists that everyone in the company is more than willing to look a little foolish to promote the firm. “About five million people watch that and it got people to recognise the brand. It was basically a free advert,” he enthuses. Since then they have invited John Prescott in for a show that highlighted Yorkshire businesses and even agreed to grill candidates for a product development role in front of the cameras on Channel 4’s The Job Interview. The successful applicant was Calum, who took the whole process in his stride and is now one of the family. He says that the worst thing about his TV stardom was the pair of elderly West Country ladies on Gogglebox the next day complimenting him on the quality of his skin, which is something his friends tease him about to this day. He was unfazed by the TV cameras on that occasion, but would he still have applied if he had known that one day he would have to consume an over-saged sausage made by my fair hands? It’s a tough one to call.